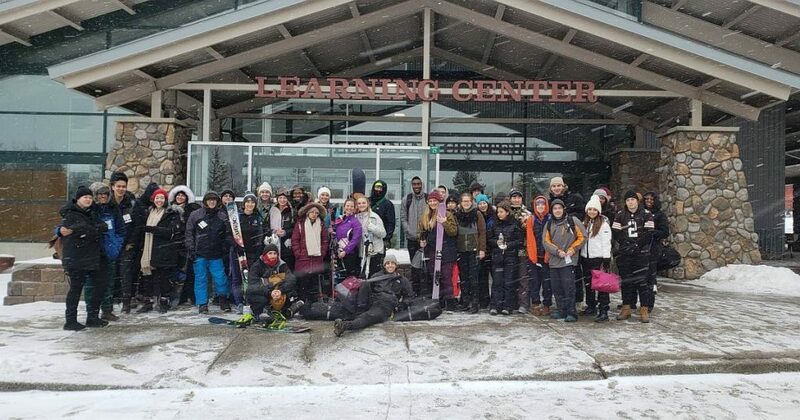 Home » Student Bloggers » CIA Students Hit the Slopes! CIA Students Hit the Slopes! Although you may think CIA students in Hyde Park, NY are stuck in their dorms on cold days like this past Sunday, in fact, they’re not! Around 30 students took a road trip to the snowy mountains of the Catskills for a ski trip winter wonderland. After a drive of about an hour or so, we explored the paths that would soon bring us to Hunter Mountain, where we were welcomed with open arms. Excited to arrive, we happened to come on a perfect snowy day, which ultimately meant powdery slopes. The climate changed as we traveled to Hunter, NY, which some of the students were amazed by because they had never seen the climate change so rapidly within just a few miles. For some of us, it was our first time skiing or snowboarding. “I fell and the hardest part of it all was being able to stop,” said Connor Eklund, a brand-new skier from Indiana. Rentals and gear were provided, and, even more important, lessons. Beginners fell and made their mistakes but with all the time we had, practice became priority and soon enough many were going down hills, working on their carving skills. Since this wasn’t my first time on the slopes, carving down the mountains at high speeds gave me time to release all the stresses from work and school that I had overcome this past week. As I glided down the mountain and rode the lift up it, beautiful views were discovered, and the snow became mesmerizing. It’s amazing how many opportunities The Culinary Institute of America provides to their students; people who come from all over the world. The Student Affairs team offers many opportunities throughout the different seasons. At least one trip is conducted every month or so, giving students a chance to explore the Hudson Valley or New York City. Trips to Broadway shows, Bryant Park, and the mountains, as well as other exciting activities, give students opportunities to find new hobbies and get to know their surroundings. It’s memories like these that help make attending school joyful and worthwhile. Thank you to Hunter Mountain and especially to The Culinary Institute of America. « Stories from the Lab: Pasta Dough – Factors Affecting Quality	» Stories from the Lab: Better Cookies—Whole Eggs or Egg Whites?